Are you on the hunt for a battery powered chainsaw? If so, you aren’t alone. 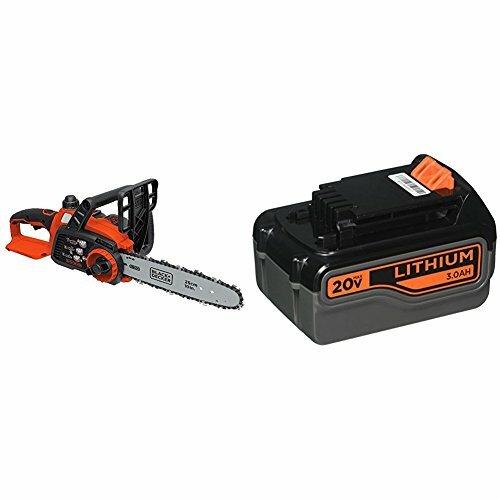 More and more people are trading in their gas powered saws for the latest generation of chainsaws that run on batteries. Whether you need a saw for occasional use around your home or plan on using one on the job, it’s natural to want the best. Nobody wants to invest money in a tool that doesn’t cut the proverbial mustard, and this is why we’ve compiled a list to help you find the best battery chainsaw for your needs. When buying a battery powered chainsaw, there are several factors you may wish to take into consideration. For many consumers, price will play a part. While in some cases, it’s logical to assume that you get what you pay for, many buyers will look for value for money over a low purchase price. Different buyers also have varied priorities, and some will be willing to spend a lot more than others. Another factor to consider is the brand name. 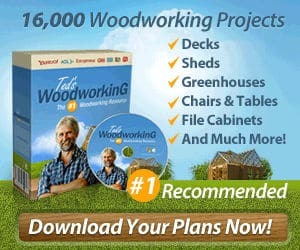 Some consumers like to stick to a brand they have used before, or buy from a manufacturer that has been recommended in cordless chainsaw reviews, for example. Reviews are also useful for highlighting pros and cons, outlining the main features, and giving you an insight into performance provided by people who have actually used the chainsaw in question before. If you’re in the market for a battery powered chainsaw, you want to buy a high-quality product, which is affordable for you and suitable for the jobs and tasks you have in mind. 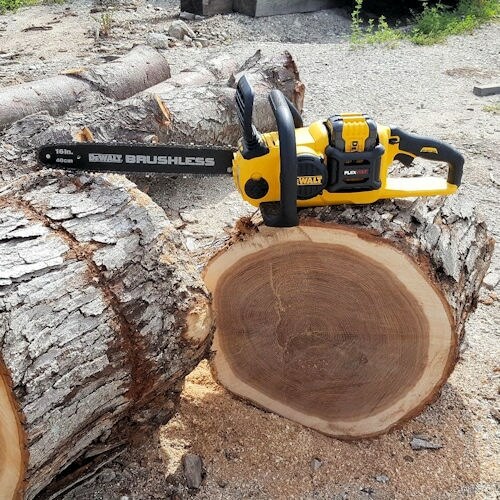 If you’ve got a list of essential requirements, or you’re keen to see how different makes and models compare, check out these battery powered chainsaw reviews. Featuring a Max 60V lithium-ion battery, the DEWALT DCCS670X1 offers up to 70 cuts per charge, making it an ideal companion for professionals on the go. Increased battery power and longevity mean this is a functional, practical addition to any toolkit. Prolonged battery life eliminates the need for frequent charging, which disrupts workflow. The low kick-back 16” Oregon bar and chain make this chainsaw ideal for both outdoor cutting and construction jobs. As many buyers have a versatile range of jobs to undertake, it’s often beneficial to buy a chainsaw that can cope with different environments and a broad spectrum of tasks. Safety is of paramount importance when using a chainsaw for any application. The DEWALT DCCS670X1 chainsaw is packed with enhanced safety features, including a chain brake and enhanced kick-back protection. This chainsaw boasts an auto-oiling system, which provides continual lubrication for superior performance. When you buy a battery powered chainsaw, you want to enjoy peace of mind that you’ve made a good investment. This DEWALT model has exceptional review scores, and it also comes with a 3-year manufacturer’s warranty. This chainsaw doesn’t come with batteries or a charger (these are sold separately), but once you’ve got your kit sorted, you can look forward to substantial output and extended battery life. You can take advantage of dual 18V LXT Lithium ion batteries, and there’s a built-in LED switch, which turns the unit off when operation is slowed to prolong battery life. 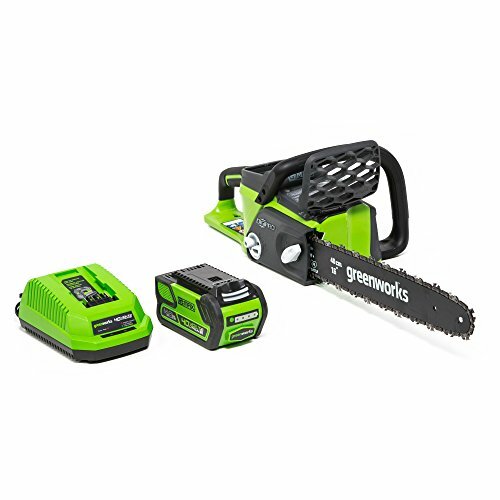 This chainsaw can also be used without leaving the 18V battery platform. This MAKITA chainsaw boasts a lock-off lever, which automatically prevents the blade from engaging accidentally, eliminating the risk of injuries and giving users peace of mind. 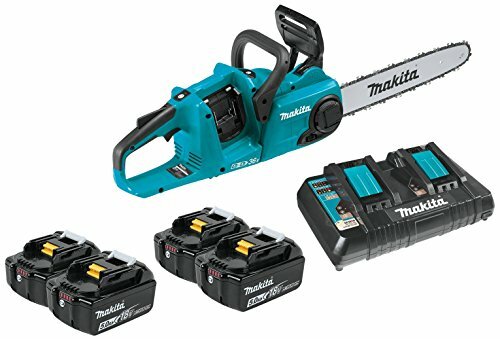 The MAKITA XCU03PT1 battery powered chainsaw features a brushless motor system, which produces powerful performance similar to a gas chainsaw. Working outside carries a risk of exposure to adverse weather conditions, which often results in chainsaws coming into contact with dirt, dust, debris. This innovative chainsaw is fitted with protective seals to shield the intricate internal components and increase the lifespan of your saw. 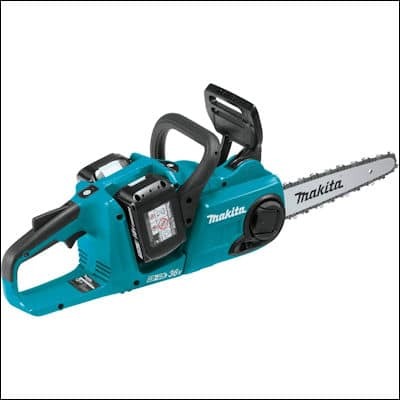 This MAKITA chainsaw is easy to use, it requires minimal maintenance and it’s also good for the environment with 0% emissions. A single charge can provide hours of joy for homeowners and professionals. Providing up to 75 cuts per charge, you can work continuously, focusing on the job in hand, rather than worrying about how much charge you’ve got left. 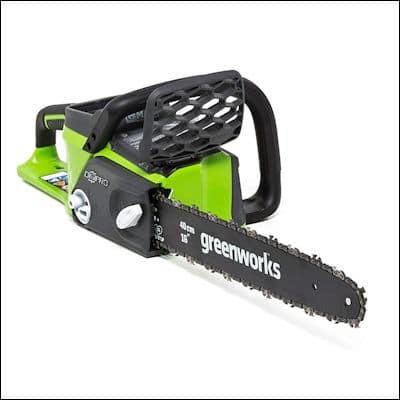 With this GREENWORKS model, you can enjoy the power and performance of a gas chainsaw without the noise or vibration strength. 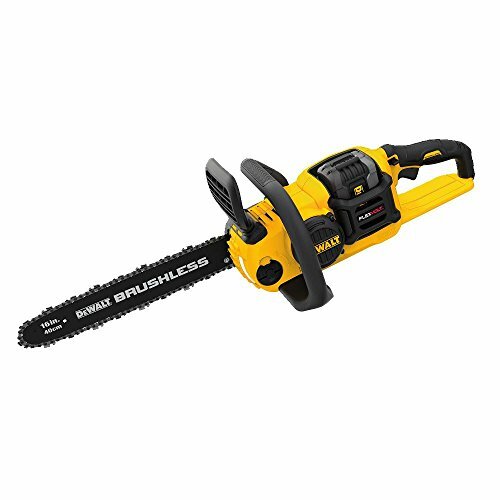 This battery powered chainsaw generates up to 70% less vibration than its gas counterparts. This is a versatile chainsaw, which is suited to seasoned pros as well as those who aren’t as familiar with battery powered chainsaws. Featuring a heavy-duty Oregon bar, an automatic, in-built oiling system, chain brake, and metal bucking spikes, this chainsaw is easy to use, and it’s also designed with safety in mind. The 20V max lithium-ion battery boasts long run time for continued use over a substantial period of time. Weighing just 7.2 pounds, this chainsaw is lightweight and it’s very easy to maneuver and also to transport. 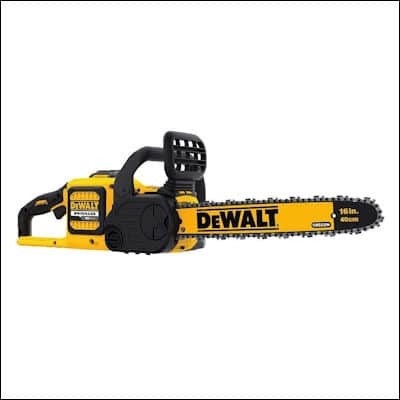 If you’re looking for a chainsaw that isn’t heavy or cumbersome, or you travel around, this could be an excellent choice. 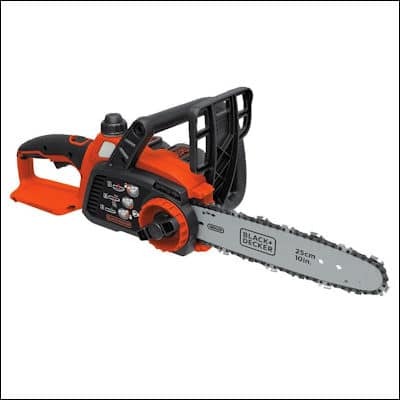 This chainsaw is very light, which makes it easy to use, and it also features a wrap-around handle, which is designed to promote comfort and increase control for enhanced safety. The Black+Decker LCS1020 has an automatic oiling system, which maintains lubrication for seamless performance. The oil window is also clear, so it’s very easy to keep an eye on oil levels. 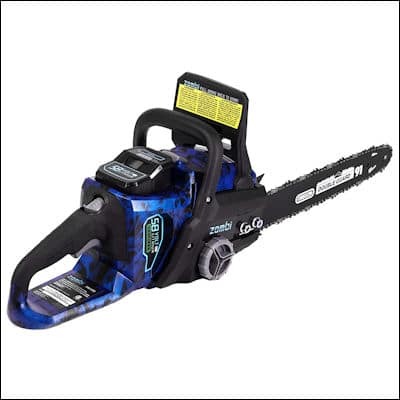 This ZOMBI chainsaw features a 4.0Ah battery, a 16-inch Oregon bar and an innovative brushless motor system for superior performance and smooth, effortless operation. In comparison to gas saws, users can enjoy faster, smoother cuts with much less hassle. The brushless motor is designed for long-term use and simple maintenance, so you can rest assured that you’re buying a product that will stand the test of time. This ZOMBI chainsaw has a range of safety features, including a chain brake, reduced kick-back, bumper spikes, hand guards and a safe-start system, which prevents accidental engagement. The ZOMBI ZCS5817 cordless chainsaw comes with a 5-year warranty and a 2-year battery warranty. This is one of the best warranties on the market. Whether you’re looking for an inexpensive, functional chainsaw without all the bells or whistles or you’re on the hunt for an advanced battery powered model that is packed with features, you want to make sure that you’re buying a product that ticks all your boxes. Hopefully, these battery powered chainsaw reviews have given you inspiration for your next purchase.